This blog's heartfelt best wishes go out to former Scottish and Lions lock Doddle Weir who has revealed he has been diagnosed with Motor Neurone Disease. Today - 21st June - is Global MND Day and the 46 year old Weir has bravely decided to go public to help raise awareness of the condition. Good luck Doddie in your fight against such a debilitating illness. 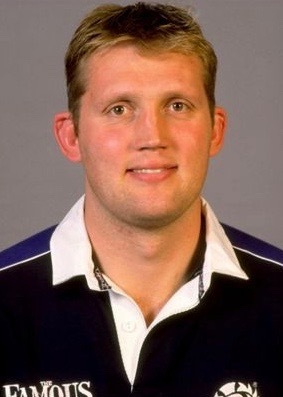 The main thing I think of when I hear the name Doddie Weir is when that scumbag stamped his knee to pieces in one of the 1997 lions tour games. On the Living With Lions film, he just seemed so philosophical about it. Yes, he was gutted of course, this dickhead just ended his tour, but he was unbelievably positive and indefatigable in spirit. Back with the squad and cracking jokes straight away. And I had completely forgotten about this one!